The gardening books and the granny one listed are actually the works of Jane Fearnley-Whittingstall. The combination is probably caused by the inability of the LT system to cope with the length of the surname. Hugh Fearnley-Whittingstall is currently considered a "single author." If one or more works are by a distinct, homonymous authors, go ahead and split the author. 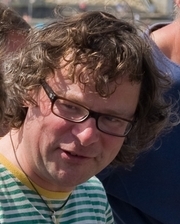 Hugh Fearnley-Whittingstall is composed of 3 names. You can examine and separate out names.